Ken Wells was born in 1947 in Vancouver, Washington. He enlisted in the U.S. Air Force Reserve on April 23, 1969, and was accepted into Officer Training School in August 1969. Wells was commissioned a 2Lt through OTS on November 13, 1969, and completed Undergraduate Pilot Training and was awarded his pilot wings in December 1970. After completing training as an F-4 Phantom II pilot, Wells began flying combat missions in Southeast Asia with the 13th Tactical Fighter Squadron at Udorn Royal Thai AFB, Thailand, in November 1971. On December 18, 1971, Lt Wells was forced to eject over North Vietnam and was taken as a Prisoner of War. After spending 466 days in captivity, he was released during Operation Homecoming on March 28, 1973. After hospitalization, Capt Wells returned to flying status, where he served as a test pilot with the 4900th Test Group at Kirtland AFB, New Mexico, and then the 3246th Test Wing at Eglin AFB, Florida. He left the Air Force on August 11, 1978. 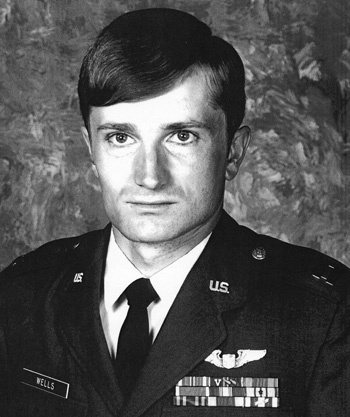 First Lieutenant Kenneth R. Wells distinguished himself by extraordinary achievement while participating in aerial flight as an F-4D Aircraft Commander at Udorn Royal Thai Air Force Base, Thailand, on 6 December 1971. On that date, Lieutenant Wells participated in a flight of two F-4D tactical fighters against a truck park concentration in Southeast Asia. Even though Lieutenant Wells had limited combat experience, he quickly adapted to the marginal weather conditions and antiaircraft fire. Despite these marginal working conditions, Lieutenant Wells delivered his ordnance with pinpoint accuracy destroying one truck and heavily damaging another. By immobilizing the trucks, the influx of supplies to hostile forces was halted. 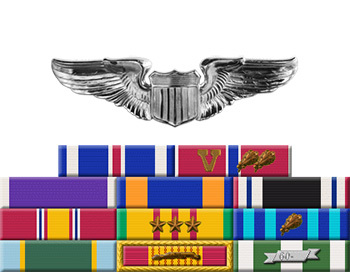 The professional competence, aerial skill, and devotion to duty displayed by Lieutenant Wells reflect great credit upon himself and the United States Air Force.